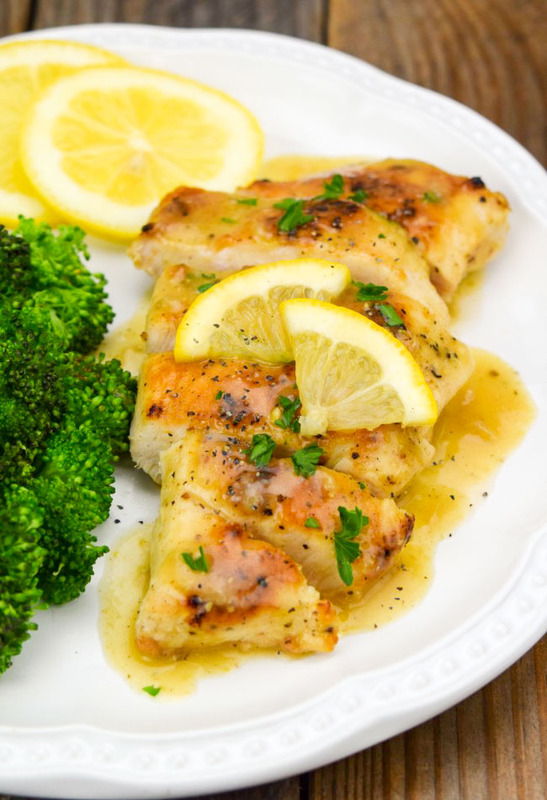 My Lemon Pepper Chicken – it’s light and crispy, with a peppery, creamy lemon sauce that transforms your table into an elegant French dining room in less than 30 minutes. Do you remember the first time you tasted freshly cracked peppercorns? The complex floral and fruity qualities can be a pleasant surprise if you’re used to a shaker of dust-like, ancient pepper that’s been passed down from table to table for generations of futile attempts at seasoning. Peppercorns were actually used as currency in the middle ages, and there are many dishes built around the wonderful flavor of these dried berries, so make sure you enjoy them freshly-ground whenever possible. I recommend keeping a grinder in your kitchen right next to the stovetop or at least replace your pre-ground pepper regularly in order to enjoy all it has to offer. 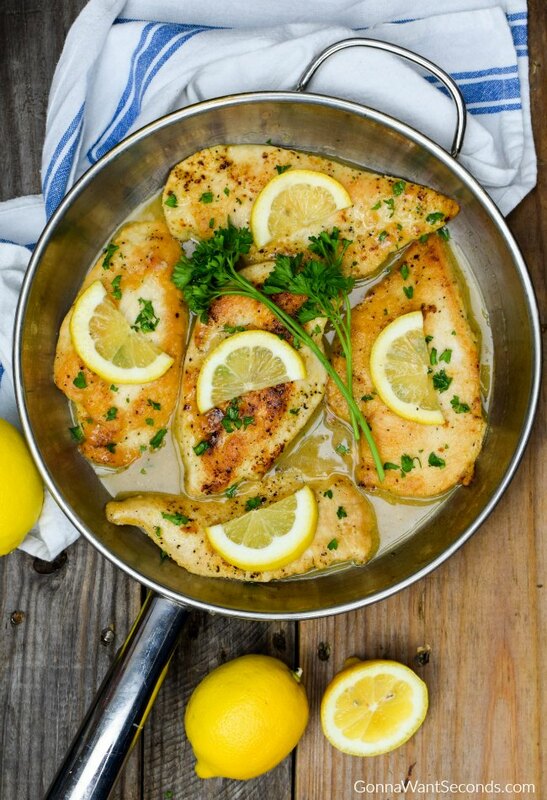 My Lemon Pepper Chicken recipe (another killer one-skillet dinner like my Chicken Florentine ) pairs pepper with lemon to create a complex flavor profile that’s full enough to carry a whole dish. The match creates an impressive but easy-to-prepare meal that’s quick enough for a weeknight but elegant enough for a special occasion. The best part is the whole thing will be on your table in less than 30 minutes . . . and gone in less than five. IS LEMON PEPPER GOOD ON CHICKEN? Chicken is a nice neutral flavor canvas that works well with lots of different herbs and spices, and lemon pepper is no exception. The tangy lemon, subtle heat and fruity quality of the peppercorns really are the perfect spice blend for any cut of chicken. I’m a big fan of spice blends that can perfectly season a piece of chicken (or fish or pork), leaving nothing more than a few minutes on a grill or the stovetop between me and dinner, and lemon pepper is one of those pantry staples, like Cajun or Greek Seasoning, I always have on hand. Basic lemon pepper consists of lemon zest infused with freshly ground black pepper, then dried to intensify the oils and flavors of both. Most blends include a little salt and may have a few other complementary ingredients like garlic or onion. I’m a fan of versions I can buy at the store (this is the one I use most often), but you can certainly make your own blend. It’s a great way to control the salt content or the addition of other ingredients you may or may not be a fan of. Whether you use a store-bought variety or home-made version, the lemon will definitely hit you first, followed by the slow heat from the pepper. You’ll find it’s a great way to easily bump up the flavor on lots of different things, so it’ll be worth the purchase (or time to make your own). WHAT CAN I DO WITH LEMON PEPPER? It’s great sprinkled into your favorite cream sauce for a quick lemon pepper pasta dish or as a salt and pepper substitute for roasted cauliflower. You can shake a bit onto corn-on-the-cob or other steamed veggies, and it’s the perfect seasoning blend for baked fish or sautéed shrimp. You can also make an epic pretzel snack mix. Just to warn you, this is addictive! One of my favorite guilty pleasures is lemon pepper chicken wings, which is a welcome departure from traditional Buffalo sauce, and the warm, tangy coating on everyone’s favorite football food inspired my Lemon Pepper Chicken. My recipe is basically a lemon pepper chicken breast, which is easier to prepare at home than fried chicken wings and definitely requires fewer napkins! Thin slices of chicken breast are seasoned with the tangy lemon pepper and lightly breaded before pan-frying, so you still get the crunchy quality we love on our wings. The breading itself is made simply with a light dusting of flour. It’s not a multi-step star like it is in a breading-heavy dish like Chicken Milanese, but it still helps the chicken pieces soak up a bit of the Lemon Pepper Chicken sauce. It’s the sauce that really shines in this recipe – it’s rich but still light and adds even more bright, lemon flavor to the dish. HOW DO YOU MAKE LEMON PEPPER SAUCE FOR CHICKEN? After pan-frying chicken, the pan is deglazed with chicken broth and lemon juice to incorporate all the bits of food from the bottom. To finish the sauce, you slowly whisk in softened butter to give it a velvety, creamy consistency any French chef would be proud of. Return the chicken to the pan at this point for a nice dip in the sauce, then you’re ready to serve. Some fresh parsley and slice of lemon is all you need for garnish (though the sauce is so good it really doesn’t need a thing!). I like to serve Lemon Pepper Chicken with egg noodles or pasta, but Lemon Pepper Chicken and rice also work great. Steamed asparagus or broccoli, or even sautéed spinach, work well too since lemon is a typical garnish for these veggies and the sauce, well, is good drizzled on everything! Just don’t forget the chilled chardonnay . 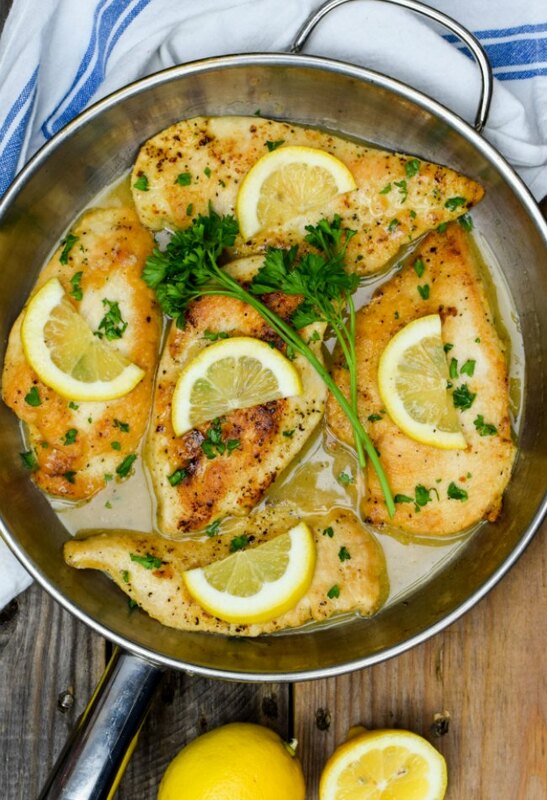 . .
Easy Lemon Pepper Chicken Recipe – it’s light and crispy, with a peppery, creamy lemon sauce that transforms your table into an elegant French dining room in less than 30 minutes. Made in One Skillet. Great served with pasta to soak up ALL the sauce! The sauce: Do not use a Teflon pan in this recipe. It’s a classic French sauce-making technique that lets the butter melt slowly and incorporates into the sauce without separating. The chicken: I use thin cut chicken, sometimes referred to as scaloppini, in this recipe. It cooks up quickly, and I love all the surface area that gets coated with the velvety sauce. You can buy chicken already prepared this way, or, if you have a good sharp chef’s knife, feel free to slice a boneless half breast horizontally in half yourself. This works best when it’s slightly frozen. But those chicken wings and other pieces: If you want to use some other cut of chicken you already have on hand, particularly ones with bones in them, I suggest searing them on the stovetop and finishing them in the oven (essentially roasted Lemon Pepper Chicken). You can make baked lemon pepper chicken thighs, lemon pepper chicken legs, baked lemon pepper chicken tenders, or, yes, even lemon pepper chicken wings baked this way. Just season and bread the pieces like the recipe calls for, then brown the pieces on all sides. Once they’re browned, remove the pieces to a foil-lined baking sheet and finish them in a 375-degree oven. The time will vary based on what cut of chicken you use – 15 to 20 minutes for thighs, for example, but the juices should run clear with no more pink in the middle. You can prepare the sauce using the leftover bits in the pan just like in the original recipe. 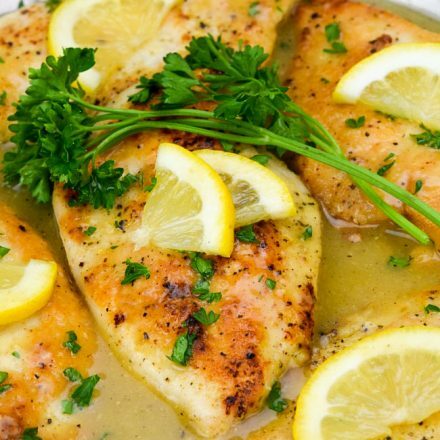 Hold the butter: If you’re looking for a healthy Lemon Pepper Chicken, you can skip the frying step and the buttery sauce but still enjoy all the lemon pepper flavor by making a lemon pepper grilled chicken. Make a lemon pepper chicken marinade with equal parts olive oil and lemon juice, a clove or two of minced garlic, a sprinkling of salt, and some lemon pepper seasoning. Let the chicken marinate for about four hours, then throw it on the grill (this technique also works well to make lemon pepper chicken drumsticks). Voila! Grilled Lemon Pepper Chicken! 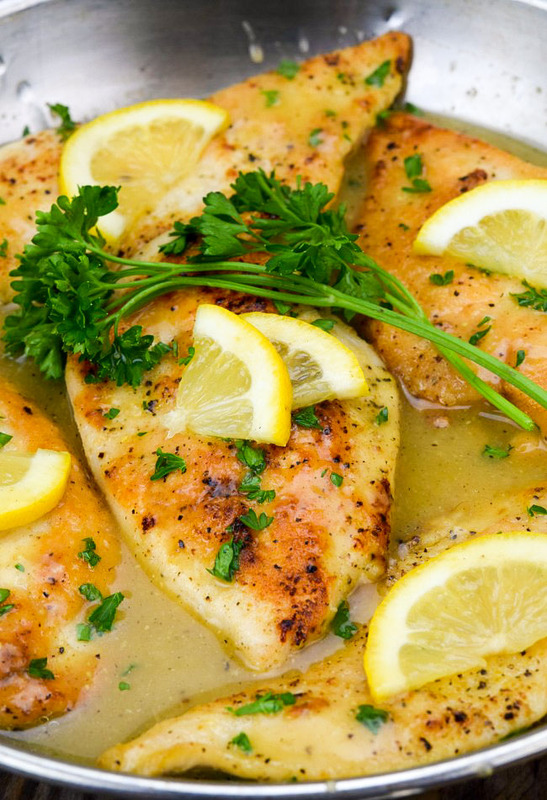 You can throw a few slices of lemon on the grill along with the chicken for a special garnish. Brown Sugar Crock Pot Chicken– One of those crock pot recipes that is super delicious, family-friendly, and super easy to make! Honey Garlic Chicken Recipe– Sticky sweet and savory, surely have you battling for the last piece! Ok, so I experimented and added a little beer in the pan.